No skill is of greater importance in school—and in life—than the ability to communicate clearly. 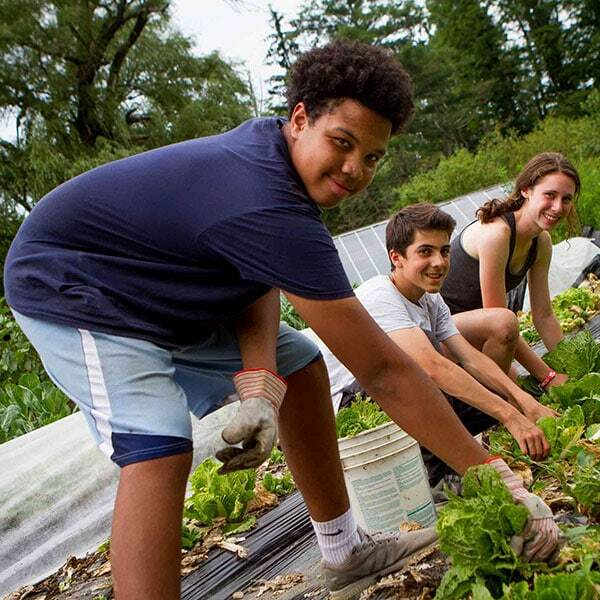 Our Writing & Hiking New England summer camp adventure program for teens on the Williams College campus offers an ideal learning environment: mornings in small classes (just 12 students), inspiring teachers (eager to help you improve your writing) and two Overland leaders (supporting and encouraging you every step of the way). 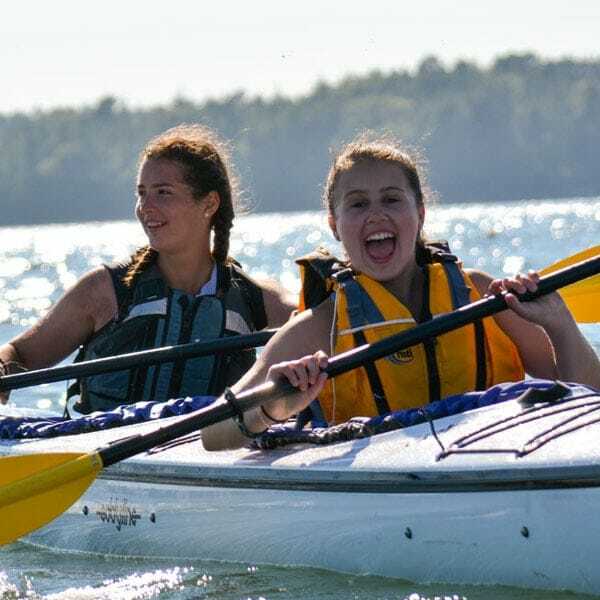 Every afternoon—and on the weekend—you'll get outside with your group of like-minded teens for adventure and exploration: you'll hike and swim and play games. 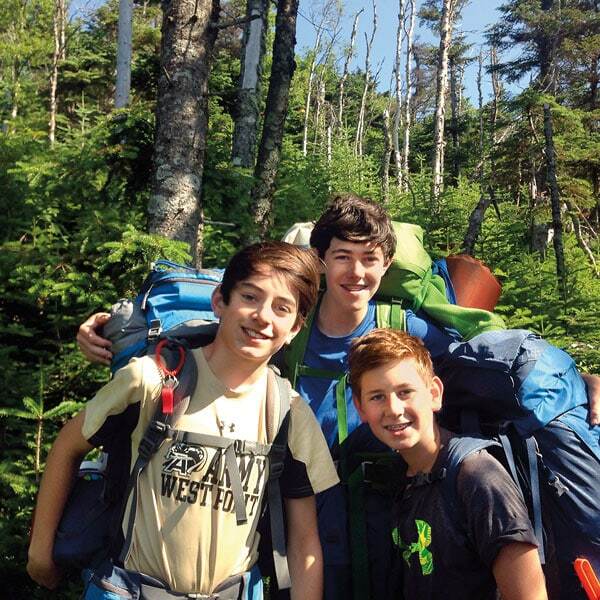 Writing & Hiking New England is just about the perfect summer program for learning and adventure... and for friendship and fun. Now that's a great summer camp! Improve your writing while exploring the Berkshires. Supportive trip mates, dynamic leaders and experienced teachers: these are the key components of Overland’s writing programs. As an individual writer, you will explore your voice and improve your skills. The class meets in the morning (when everyone is fresh) and works hard for three hours—a significant, sustained engagement with the coursework. We can’t write all day, so in the afternoon, it’s time to get outside. And what an outside it is: the Berkshires and Vermont’s Green Mountains are ideal for hikes. Of course, the first hikes are shorter and easier, but working at it every day soon increases everyone’s skills and fitness—yours, too. On the weekend, it’s time to camp and raft. It’s perfect: after a week of great classwork and fun afternoon hikes, we’ll be ready for a change, for more. So we’ll organize the camping gear, pack up and head for the hills. After camping and hiking, we’ll raft the Deerfield River. During the second week, we’ll pull it all together. Not just the writing (developing a portfolio), and not just the hiking (climbing the tallest mountain in Massachusetts), but the whole experience: learning and fun and friends and everything that makes an Overland summer great. We will realize that the strength of the experience is in the relationships—the friendships that make the hard work fun, that keep spirits up on the trail, that fill every day with laughter and smiles. You’ll head home a better writer. But just as importantly, you’ll head home more fit, with new friends and fond memories. Writing & Hiking New England—an ideal learning environment, certainly, but more than that, much more than that. The perfect combination of academic work, hiking and activities. The kids really connected. Great morning classes & terrific afternoon hikes. We’ll arrive in Williamstown in the afternoon, unpack, move into our dorm and stretch our legs on an easy hike. Our writing teacher will introduce us to the curriculum, and we’ll do a few pre-writing exercises. Every weekday morning, our teacher, with the support of our two leaders, will guide us through the process of expository writing. Together, we will review and learn stylistic and grammatical practices like word choice, paragraph structure and punctuation. In the afternoons, we’ll explore hiking trails in the Berkshires and Vermont’s Green Mountains. We’ll start small with short hikes to swimming holes and waterfalls, building to more challenging hikes up local mountains and ridges. Some afternoons, we’ll pair a shorter hike with a cultural trip to a local art museum like The Clark or Mass MoCA. In the evenings, we will cook dinner together, play games and reflect back on the day. On the weekend, we’ll leave Williamstown and explore the local mountains. We’ll test our hiking strength on a day hike and then celebrate with a rafting trip down the Deerfield River with professional guides. We’ll spend our nights at an established campground, learning the basics of camping. After a weekend outside, we will return to Williamstown for our final four days of morning classes and afternoon hikes. We’ll apply skills learned during our first week of class as we write an expository essay inspired by National Public Radio’s This I Believe. We’ll brainstorm, outline, write a first draft, read out loud, edit, revise and produce a final product in a supportive and encouraging environment. On our last day of class, we will compile all of our work into a comprehensive writing portfolio. Throughout our final week, we’ll continue to grow as hikers and prepare for a challenge hike up Mount Greylock, the highest mountain in Massachusetts. At the summit, we will appreciate the views and reflect on a fantastic two weeks together. 2 nights of frontcountry camping with access to flush toilets and hot water. We travel light at Overland! 3,000-5,000 cubic inch (50-80 liters) suitcase or duffel bag. Suitable for day hikes, class and cool evenings. Hiking boots that are low to high cut, depending on your desired ankle support. Choose comfortable boots and make sure to break them in before the start of your trip. Closed-toed sport sandals, water shoes or old sneakers to wear on the water. Flip flops or Crocs work well. The Williams College dorms are not air-conditioned. Overland will have some fans available. If you are arriving by car, we encourage you to pack a small fan. 1 GB of memory to save your writing projects at trip end. Overland provides you with a laptop. If you have writing samples you want to bring with you, bring those documents on a flash drive or as a hard copy. Who will my child have for a writing teacher? Cynthia Saunders Quiñones is a poet and teacher living in Berkshire County. She has taught literature and writing in a classroom setting for more than 16 years. She holds a B.A. in English and creative writing from George Washington University, and an M.F.A. in poetry from the Warren Wilson College Program for Writers, where she was a Rona Jaffe Fellow. She currently serves as an artistic mentor for Barrington Stage Company’s Playwright Mentoring Project, as well as a workshop facilitator for the Northern Berkshire Community Coalition’s Teen Writing Workshop. In 2016, she received a Martha Boschen Porter Fund Grant from the Berkshire Taconic Community Foundation to complete a first book length manuscript. Her own poems and articles have been published in various journals in print and online. Cynthia is returning to teach the Writing & Hiking New England class for her second summer. Mallory Tarses has taught high school English for 18 years in Los Angeles, California and Wilmington, North Carolina. In September, she will begin her 15th year at Cape Fear Academy, teaching American Literature, AP Language, and SAT Preparation courses. She received her B.A. from Brown University, her M.F.A. from The Johns Hopkins Writing Seminars, and her M.A. in Fiction Writing from the University of North Carolina at Wilmington. Her short stories have appeared in Ploughshares, the North American Review, the Kansas Quarterly/Arkansas Review and other literary magazines. Mallory is returning to teach the Writing & Hiking New England class for her seventh summer. Rebecca Tucker-Smith has taught middle and high school English at Mt. Greylock Regional School for nine years. She received a B.A. in English and Fine Arts from Amherst College and a M.S. in Education from the University of Oregon. While Rebecca has taught a variety of grade levels, she current teaches AP Language and Composition in addition to serving as the Curriculum Leader for the English department. An avid reader and an enthusiastic writer, Rebecca considers herself a lifelong learner and is returning to teach the Writing & Hiking New England class for her second summer. What is the weather like on Writing & Hiking New England? Your child’s group will have access to showers and laundry regularly. Get ready for a week full of fun, friends & learning. On Writing & Hiking New England, you will go on a total of 10 day hikes. You will hike on well-established trails in New England through a variety of landscapes, including forests and more open alpine environments. You will travel over terrain ranging from gentle and rolling to rocky and steep. In the month before your trip, you should break-in your hiking boots (wear them a lot!) and complete the pre-trip training (see below). Once on your trip, you'll find that enthusiasm and a positive attitude will help to make the trip a success for you... and for everyone in your group. 2 weeks before your trip: take three 1-hour hikes or walks in your boots . 1 week before your trip: take two 2-hour hikes or walks in your boots . Overland classrooms are small, supportive and focused—you will spend four hours each weekday morning working with a master teacher and two Overland leaders. You should arrive excited about writing and ready to work hard to improve your writing skills. While we do not require a specific level of writing or any pre-trip writing materials, we expect you to engage in our writing curriculum. During your trip, Overland will provide the curriculum, writing prompts and laptops. All you need is your enthusiasm, energy and a flash drive to save your work.